1. LUSH/Pamper: Technically my first idea is pamper but nothing says pamper to me better than a few bits 'n' pieces from LUSH. Candy Mountain is a Limited Edition Christmas Bubble Bar from LUSH that smells like my all time favourite LUSH scent, Rockstar. In saying that, anything that will allow the gift recipient to be pampered/pamper herself is a winner in my book. 2. Beauty bits - I couldn't go through this post without mentioning beauty products at least once and here it is. This Sephora Deck The Halls Ribbon Hair Ties bauble is a super cute but I think any that's suited to the person is perfect. I'm thinking hair bits, new lip glosses, limited edition nail polish etc. 3. Lollies - Everyone loves lollies. Don't know what to get to fill up that oversized bag? Eh, that's nothing that a bag (or five) of lollies can't fix. I've even been known to give a huge container of lollies (personally selected, mind you) to my lolly loving brother in law as his main gift! 4. Voucher - I honestly think vouchers are a great way of showing people that you know them well enough to select a store they may like without having to actually choose a gift. Vouchers also make a great addition to little hampers, stockings etc. 5. Socks and jocks - This is such a Dad present, isn't it? I think there's some truth to it though, I mean, have you ever seen a Dad be unappreciative about receiving such a gift? I think not. This idea isn't exclusive to Dads though. Anyone will appreciate new socks, jocks, underwear or pyjamas. It's all relative! 6. Jewellery - From costume jewellery to beautiful pieces from someone special, so many people would happily accept. If you're looking for a good stocking stuffer for someone who wears a lot of costume jewellery, Lovisa has some great Christmas sets available at the moment. They're super cute and, of course, affordable. 7. Stationery - I don't know anyone who won't appreciate some well thought about stationery. Typo has great packs like the one featured above that'll be perfect for the Christmas stocking (or as a secret Santa present, really..), however Smiggle is a great option for kids. 8. Books - I think books are such a great ideas for a stocking. There's a book for every person, whether it be the newest release by their favourite author (I'm yet to try my favourite author's newest release, Wedding Night by Sophie Kinsella) or a book about their favourite hobby. This idea is also great for all age groups, from children to your grandparents! So those were my ideas on how to fill the stocking this Christmas! Remember, Christmas/Holiday stockings should be personalised for the person you're gifting it to; take their hobbies and favourite colours etc. into consideration to get them a gift you know they're going to love! I really hope these ideas help you pick the perfect gifts and ladies, please tell me, what other items would you have added to this gift guide? What would you love to receive this holiday season. 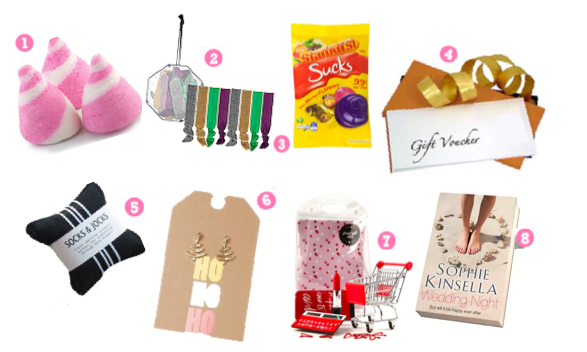 Also, what would you like to see me giveaway from this gift guide? Any ideas for men other than socks and jocks? Jewellery and make-up, no worries for the girls but I have a boyfriend stocking I have to fill this year and have no ideas ahah. have you ever considered like "personal Vouchers" I used to do them for my mum when i was little but now do them for my BF when i run out of inexpensive little gift ideas. for example "dinner on me" or "back/foot rub" or "I'm Driving" (you can go a bit more adult if you so desire as well.) and that way you can do little personal things that only the both of you get. its cute and they can be a whole lot of fun to make. Thanks for some great idea's, I didn't know Sophie Kinsella had a new book out,have been a fan of her's since Confession's of a shopoholic.